It is fair to say I am fairly obsessed with the fit of my horse’s saddle. Jules is so brilliant at communicating when something is not quite right, but as a result I am constantly looking out for signals from her. Sometimes it’s an ear flick, sometimes turning to look back at what I’m doing, sometimes she’s attentive, sometimes indifferent. She might fidget, raise her head or move away or towards my interaction. Sometimes she will nibble on the stable door or another inedible object as a distraction from something causing discomfort, or perhaps nip at the air in frustration. She has also been known to ‘nibble’ on me to really get her point across!! And this is just signals when I’m on the ground – she of course continues to communicate when I’m actually on her back too. As a result, I do tend to pick up on when comfort is not optimal for her, particularly with regards the very invasive fit of a saddle or girth. And the discomfort that our horses may experience is unsurprising – imagine having a heavy leather contraption placed across your fragile vertebrae, pressing down on your back and ribs, restricting the lateral movement of your back and expansion of your lungs in your ribcage, potentially preventing full range of shoulder movement and digging into the base of your neck each time you lift your head. Then add in an overtightened ‘belt’ to hold this possibly non-fitting wobbly contraption in place, unhelpfully placed across your highly sensitive and ticklish stomach area, with the potential for catching your skin uncomfortably and scraping the back of your arms each time they move. If subtle signals of discomfort from our horses are ignored, they will often become more obvious visual signs, such as those shown below. If ignored still further, behaviour may deteriorate or horses will become sullen and disinterested as they silently endure their daily pain. 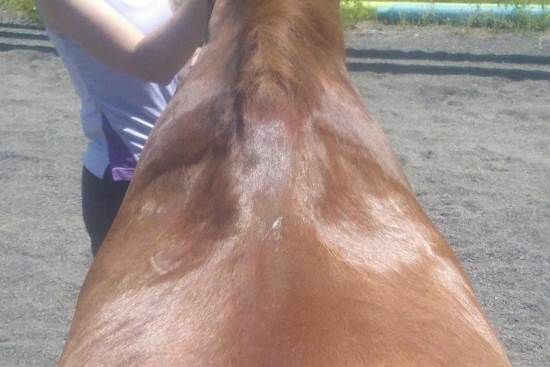 This potential for discomfort, and the resultant soreness and tension I see during my massage work, led me to attend a fantastic course about saddle fit last weekend. This course was led by a Master Saddler, and took us back to the basics of saddle build through to the intricacies of fitting to particular shapes and movement types. My attendance does not make me in any way qualified to ‘fit’ saddles, but certainly has given me an insight into spotting where fit is potentially unsuitable. This knowledge will be invaluable as I launch, from today, my service offering of my ‘Ridden Impact Assessment’, which can be booked as a basic saddle pressure check alongside massage, or as a full session assessing first saddle then rider pressure, both statically and in motion. So how does it work? The idea is incredibly simple – the latest technology has been used in my ‘Estride Harmony’ sensor, allowing multiple pressure points under saddle placement to be relayed in real-time to my device during static check of saddle imbalance and rider placement. The sensor fits into a washable saddle pad (see below), which is then applied to the horse’s back prior to application and girthing the saddle. Changes to these pressures can then be recorded during motion for later analysis, either with or without rider, the latter enabling some focus on the impact of rider asymmetry (leaning) or misplacement of weight front to back. I am so excited about the potential this device might have to increase awareness of the impact our riding might have on the delicate tissues across the back. I am hopeful that any resultant adjustments will increase the comfort and therefore harmony between horse and rider, and help to prevent rebuild of soreness post-massage.